Over 16 years career in the NBA, James only once was the highest-paid basketball player in the League (season 2016/17), although almost every year he was the best player in the last one and a half decades. But do not rush to sympathize with. His total salary, given the current season, is $270 million is the best figure for the current players and the fourth largest in history after Kevin Garnett, Kobe Bryant and Shaquille O’neal. And yet top money LeBron always made off-site. Its annual advertising revenues sometimes exceeded the salary in 2-3 times. Nike was the biggest sponsor of the James with his debut season in the NBA. The first transaction has cost the company over $100 million over 7 years, including bonuses and royalties. For comparison, the first contract with “Cleveland” LeBron received $18.8 million over 4 years. Personalized sneakers LeBron was the best seller among the models of existing players most of the last decade (Michael Jordan still holds the lead overall). James has twice renewed the contract with Nike. The latest version was signed in late 2015 and is a lifetime agreement. According to business Manager of LeBron Maverick Carter, the company will pay the player at least $1 billion. During his professional career, James has represented more than 15 brands. Its total advertising revenue, including a deal with Nike, will approach $600 million by the end of the 2018/19 season. But his financial status supported by other profitable transactions that go beyond the traditional relations “athlete brand”. Attachments LeBron in Beats Electronics has paid off for Apple in 2014 paid $3 billion for the headphone manufacturer. Finance James has also benefited from a partnership with Fenway Sports Group (FSG) in 2011. LeBron got a small minority stake in soccer club Liverpool FC, owned by FSG, in exchange for certain marketing rights. Since then the club value has increased from $552 million to $1.9 billion. In 2017, LeBron refused $15 million guaranteed contract with McDonald’s, for the sake of participating in a startup Blaze Pizza. According to ESPN, now it’s the fastest growing restaurant chain, and the cost of investment share of James and his partners grew from $1 million to $25 million in addition, LeBron is the franchise owner in Chicago and South Florida. 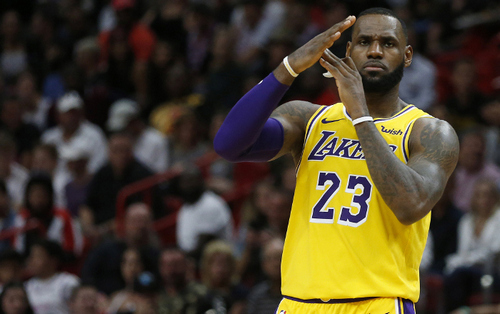 In the summer of 2018 LeBron moved to Los Angeles (for the Lakers) as a free agent, being in the heart of the entertainment capital of the worlds. And this is especially important for his production projects. In fact, besides Uninterrupted, which received $15.8 million investment from Time Warner in 2015, James has a private production company SpringHill Entertainment. There have already created such television shows as The Wall (game show) and Survivor’s Remorse (Comedy series “survivor’s Remorse”), and now shoot a remake of the 1990 film House Party (“house party”). In summary the game James four MVP (most valuable player), 12 hits in the top five of the NBA in the season 9 finals of the championship, but his greatest achievement may be a long term project in Northern Ohio, where he has focused his charitable efforts. Charity, the LeBron in 2011 launched the I Promise program, in which receive the support of more than 1,300 public school students native to James city Akron. And in the case of admission to the College are guaranteed an academic scholarship. This year, LeBron went on and through I Promise, opened in Akron’s first school by donating to this project more than $40 million In the first set 240 students of the 3rd and 4th graders. Training in school (as well as form, nutrition, Bicycle and bus home in a two-mile radius) is free, that is available even for children from low-income families. In addition, all graduates will be able to continue their education at the University of Akron. LeBron has announced a goal to become a billionaire — for example when appeared on the cover of GQ in 2014. he’s already halfway there. Hi would you mind letting me know which web host you’re using? I’ve loaded your blog in 3 different internet browsers and I must say this blog loads a lot quicker then most. Can you suggest a good web hosting provider at a fair price? Cheers, I appreciate it! And he actually bought me dinner due to the fact that I found it for him… lol. So allow me to reword this…. Thank YOU for the meal!! But yeah, thanks for spending time to talk about this topic here on your web page. If some one wants to be updated with most recent technologies therefore he must be pay a quick visit this web site and be up to date all the time. I’ve loaded your blog in 3 different web browsers and I must say this blog loads a lot faster then most. Can you recommend a good web hosting provider at a reasonable price? Your method of describing the whole thing in this paragraph is truly fastidious, every one can easily understand it, Thanks a lot. Hello! I’ve been following your weblog for a while now and finally got the courage to go ahead and give you a shout out from Lubbock Tx! Just wanted to say keep up the excellent job!